How do you guys feel about the end of support for Windows XP? Do you want to hear my thoughts on getting people to migrate to Windows 8? Oh, wait, you don’t care about that because it’s not interesting. At all. Well, actually it is to me, but that’s because I’m a geek. And it’s my job. Right now, that’s what’s taking up my head space. That and when will I be able to stop stressing about my new house/move?! I haven’t had a ton of time to cook, but decided I needed to make something last night and found this little beauty of a recipe. This dinner took 30 minutes from start to finish. I am a huge fan of parmesan chicken strips, I’ve tried several recipes. This one was new to me, but super easy and delish, the difference was coating the chicken in buttermilk and letting it sit. I served with sautéed asparagus and roasted kale – I am trying to do 2 veggies instead of 1 veggie and 1 starch, at least sometimes. I made 2lbs of the chicken tenders, thinking Oliver would love it. He ate one bite. Now I have 1.5lbs of chicken to get through in 2 days. Anyone want to come for dinner? I’m serving leftovers! I have been thinking of creative ways to use and think it would make for a really good kale chicken Caesar salad. I think I’ll do that for dinner tomorrow. Stir the Parmesan and bread crumbs, S & P in a pie dish. Remove the chicken tenders from the buttermilk and dredge them in the bread crumb mixture to coat completely, pressing to adhere. Arrange the coated chicken tenders on the baking sheets, I used parchment paper to cover the sheets, spacing evenly. Drizzle the remaining 2 tablespoons of oil over the chicken tenders and bake until they are cooked through and golden brown, about 12 minutes. All of Seattle is watching the Seahawks play the 49ers for a shot at the Superbowl. I, however, am listening to Jake & the Neverland Pirates as I am home with a sick little guy who has commandeered the TV. I am making one of my fave Sunday dinners, roast chicken and veggies. Until about 5 years ago, the thought of roasting a chicken was completely intimidating. In hindsight, I have no idea why. It is seriously easy, and one of those dinners you just throw in the oven and let ‘er rip. Perfect for company, makes your house smell amazing. I have been doing various versions of roast chicken, one of my favorites is Ina Garten’s Engagement Roast Chicken. I love the gravy you make at the end, it’s the best part. I have also been digging Smitten Kitchen’s Flat Roast Chicken, where you remove the backbone from the chicken (or have the butcher do it). This shortens the cooking time to about 45 minutes rather than 75 minutes. Both are totally fantastic recipes. Staples. But today I felt like getting crazy today and trying something new. Enter Martha Stewart’s Perfect Roast Chicken. What I like about this guy – you pierce a lemon all over and insert the entire thing into the cavity, as well as garlic cloves, fresh thyme, salt & pepper. Gives the final product such great flavor. Veggies on the menu tonight are Yukon gold potatoes, parsnips, yellow onion and carrots. Also planning to roast a little kale to green things up. Cut up all veggies and toss with olive oil, salt, pepper and fresh thyme. Make sure the veggies are all around the same size. Remove the giblets and excess fat from the chicken cavity. Rinse chicken inside and out under cold running water. Dry chicken thoroughly with paper towels. Tuck the wing tips under the body. Sprinkle the cavity of the chicken liberally with salt and pepper, and set aside. Place the lemon on the counter and roll back and forth, this softens the lemon and allows the juice to flow more freely. Pierce entire surface of lemon with a fork. Using the side of a large knife, gently press on garlic cloves to open slightly. Insert garlic cloves, thyme sprigs, and lemon into cavity. Place chicken in large roasting pan. Cut about 18 inches of kitchen twine, bring chicken legs forward, cross them, and tie together. Spread the softened butter over entire surface of chicken, and sprinkle liberally with salt and pepper. Spread veggies evenly around the chicken in the roasting pan, if they are too crowded, they will steam, not roast. Place in the oven, and roast for 15 minutes. Reduce temperature to 350º after 15 minutes. Continue to roast until skin is deep golden brown and crisp and the juices run clear when pierced, about 1 hour. When chicken seems done, insert a thermometer into the breast, then the thigh. The breast temperature should read 165º. Remove chicken and place on a platter to rest for 10 – 15 minutes. Raise temp back up to 425° and throw the veggies back in to continue roasting for an additional 15 minutes. Pretty exiting, Oliver let me turn on the Seahawks game and we got to watch them beat the 49ers and get their 2nd chance to play in the Superbowl!! Dinner was delish as well. Good Sunday in Seattle. After coming off of my heavy eating and drinking Portland weekend, I wanted something healthy and easy for dinner, but still delicious, obv. Oliver is with his dad on Mondays, so I’m just cooking for me, but I like to make enough for Tuesday lunch leftovers. 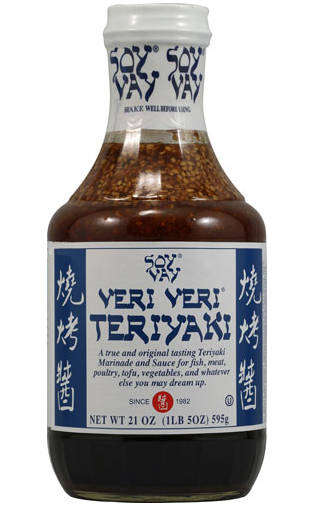 One of my go to’s in this situation is marinating some chicken in Soy Vay Veri Veri Teriyaki. If you haven’t used this, it’s brilliant (plus, the name is so cute!). Oliver loves it and it’s a one stop shop for flavorful, teriyaki tofu/beef/chicken/veggies (there are 5 different flavors of Soy Vay, but I like the Veri Teriyaki). This isn’t a fancy dinner, there is no recipe required, but it’s simple and isn’t simple a relief sometimes? 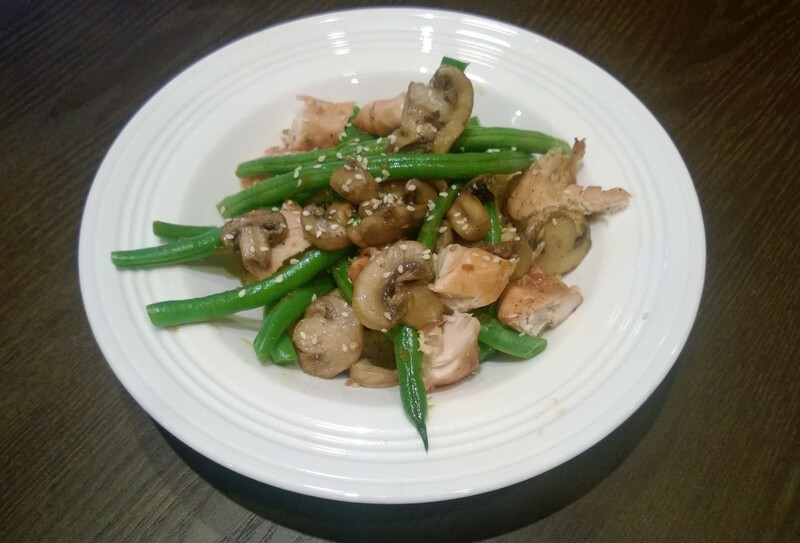 Bonus – if you split this into 3 meals, it’s under 500 calories per serving. I stopped by TJ’s on the way home from work and picked up the ingredients (organic chicken tenders, green beans, mushrooms, quinoa). I threw the chicken in a shallow baking dish with a sprinkle of salt and pepper, then coated with Soy Vay, covered and put it in the fridge to marinate and headed off to Pilates – it got about an hour of marination time. Now it’s time to start tackling my DVR…..